Light is the most important thing that empowers every Single live on earth. It’s kind of magic that does the tricks so we perceive the same thing in thousand different ways. Apart from changing our mood through material sources, it winds up our bio logical clock and heals us from within. Nowadays lighting objects come in different shapes in all ranges. You might have purchased few for yourself and some as a present for others. 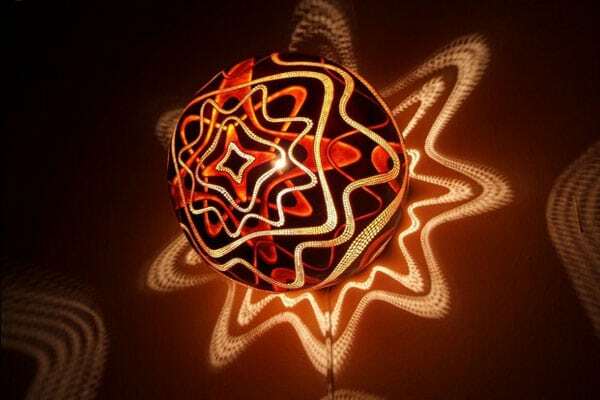 The Gourd Lamp sculpture, you are about to read here is the most special one. During the day and when it is not connected to power, it will simply sit on your living room or on your table as a decorative object. You will never know what this lamp is capable of until you hit the button and let it glow. When the light penetrates through thousands of carefully designed artistic holes, it takes your background, wall, screens, furniture, and everything around as a projecting space and fills your room with its beautiful traces. It’s better to visualize this magic on your own. Take a look at the images below and visualize what I am talking about. Now don’t you want to see the brilliant mind behind this beautiful creation? Meet the Poland artist, Przemek Krawczynski. He designed his first ever gourd lamp using gourd fruits back in 2009. Since then his passion on creating lamps has been grown immensely. Przemek is basically a civil engineering graduate and he was working in an architectural studio while he was designing his first guard lamp. However, in 2010 he decided to quit the job and follow his passion. He uses guard fruit to design most of his art work and to your surprises most of his works are done in the dark. How beautiful!. Guard fruits are mostly found in Senegal of Africa. Prezemek learned and master this art by himself with a bit of an inspiration. Self-fulfillment and satisfaction from my work are more important for me than the number of lamps I can create within a certain time span”. This man loves his job. Sometimes he takes 2 to 4 months to design a single lamp. He says in some lamps, the design and hole markings are done well before the actual work gets started. You have one more reason to love his art. Every single lamp he designs is a unique piece. You can’t find any two lamps with a same design or pattern. He draws his inspiration from complex, geometrical patterns. As I mentioned, by day this guard living room lamp will seem like a unique sculpture. 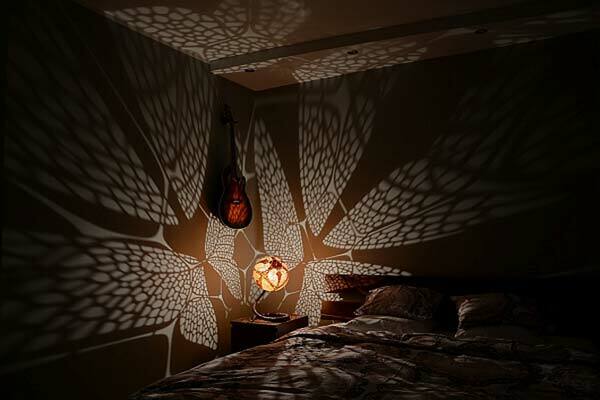 During the nights, it comes alive with the help of light penetrating through thousands of tricky holes. 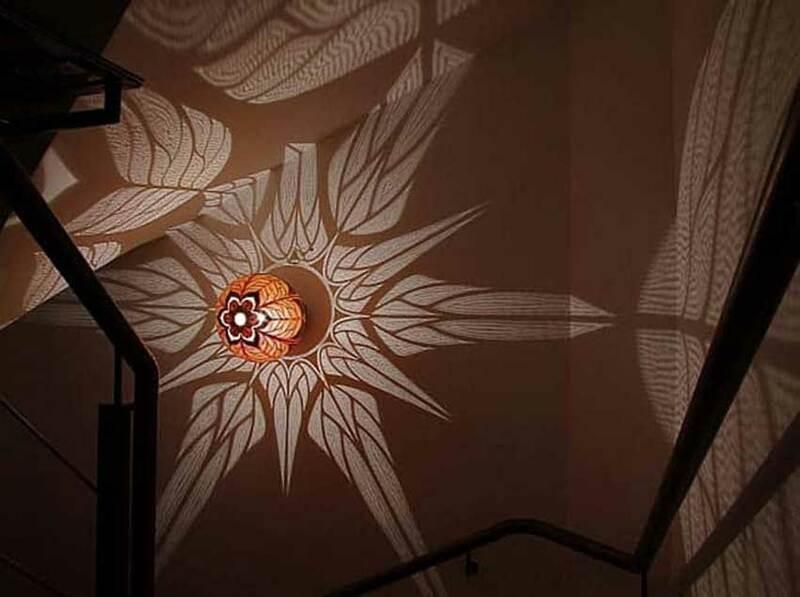 At the moment the flowing shadow of these intricate designs start to cast its patterns around the space, every eye that witness this magic go speechless. Besides to the guard living room lamps, he also designs table lamps, wall lamps, pendant lamps and floor lamps. Though these lamps sound bit expensive, they totally worth it. These lamps are priced in the range $2500 to $9000 based on the size, design and intricacy.